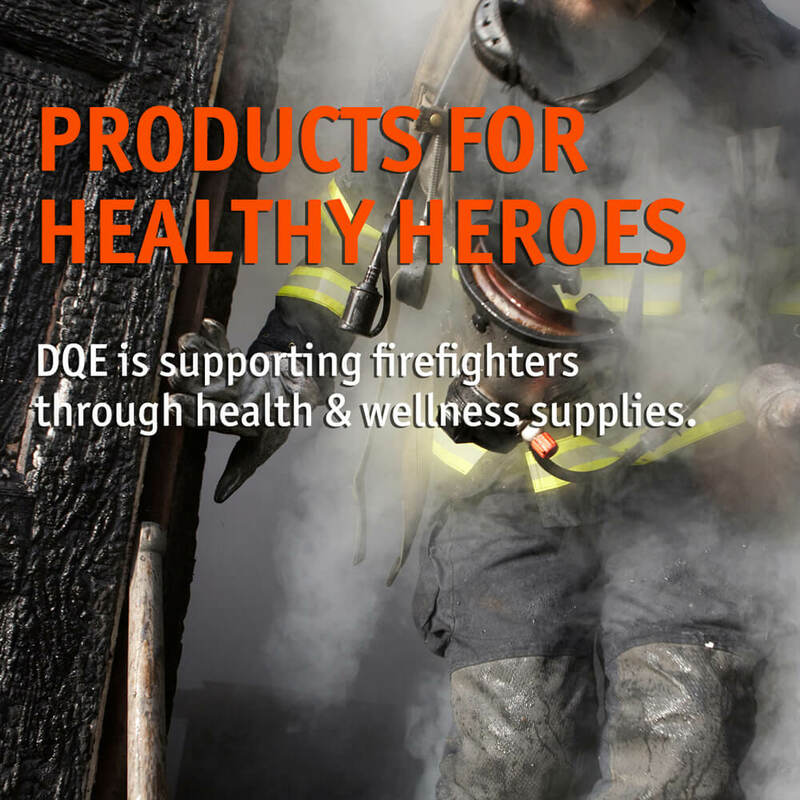 DQE is committed to supporting the health of firefighters with a new line of Firefighter Health and Wellness products. Hundreds of firefighters are being diagnosed with cancer annually, and according to the Firefighter Cancer Alliance, it has become the second leading cause of death for firefighters in the United States. Research demonstrates that chronic exposure to heat, smoke, and toxic flame retardants through inhalation, ingestion, and skin absorption place firefighters at increased risk of cancer. DQE’s Firefighter Health & Wellness line of products is based on the latest research related to firefighter cancer prevention. This line builds on DQE’s popular 37°C firefighter rehabilitation line that supports the NFPA 1584 Rehab Standard and continues our dedication to firefighter safety. DQE’s Firefighter Health & Wellness line contains products that reflect the best practices for reducing exposure to cancer-causing carcinogens through Zone Establishment, Gross Carcinogen Decontamination (PPE and Skin), and Post-Decontamination. Zone Establishment – Zones indicate where decontamination and rehabilitation procedures should occur. DQE has a variety of colored ground tarps, zone tape, and privacy screens to visually indicate where procedures take place, making it easier to enforce established protocols. Personal Protective Equipment (PPE) Decon – Following exit from the fireground area and while still on air, immediate gross decontamination of PPE using soapy water and a brush takes place. DQE has a variety of brushes, sprayers, and pools that assist in decon measures. Skin Decon – The exposed areas of the body (neck, face, arms, and hands) should be wiped off immediately following the removal of PPE. DQE reviewed numerous different types of wipes and found Responder Wipes to have an excellent extra-large size (12″ x 24”), thick fabric, and a non-offensive odor. Post-Decontamination – Complete the decontamination process by changing out of clothes and into DQE’s change-out clothing after exposure to products of combustion or other contaminants. DQE’s goal is to make a difference in the lives of firefighters by providing practical products that make them safer. Through knowledge, making cancer prevention routines a priority, and the right supplies, firefighters can minimize their exposure to carcinogens. More information on DQE Firefighter Health & Wellness products is available at dqeready.com/FirefighterHealth. Headquartered in Indianapolis, Indiana, DQE designs and sells essential products that emergency responders depend on to enhance their jobs while saving lives. Learn more about DQE and its family of products at www.dqeready.com.